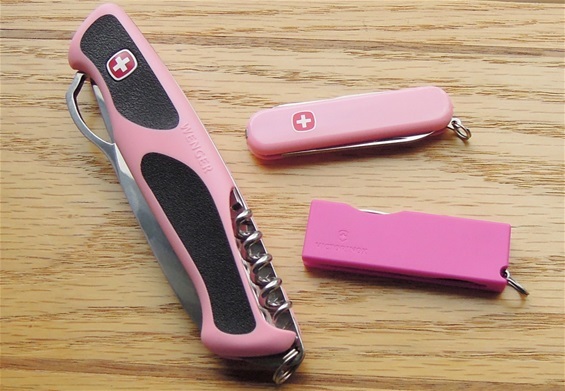 Yes this is the real deal and a Wenger knife with a special color, it is pink! I believe this is one of the knives that Wenger introduced in 2013. This RangerGrip 61.891 Pink is marked 02 2013 on the box. I know that Wenger introduced some different knives with pink color at this time in history. I can say that pink color is not a new invention on Wenger knives and it’s been used before. The RangerGrip 61.891 is special because it is part of the last knives introduced by the Delémont plant. In the history of knives we can read about the introduction of new colors and knives directed at the female market. Today the situation is a bit different but we can say that the color on this knife could be directed at women. This sad we know that today the situation is so that this color or knife just as well could be “not gender-specific” For me I can sum this color up with one word and that is COOL! It is a bit difficult to get the full color shade for the pink on a picture but the black together with pink is nice. The functions are like on the pictures + awl and corkscrew. These functions are well known New Ranger tools today. On this picture you can see the RangerGrip together with the Victorinox Tomo Pink and a 65mm Wenger 1 81 11 91 with a color that looks very similar to the Ranger. We know from history the talk in the late 1980s about the Wenger pastels. At this time in history new knives and colors had to be introduced for the female market. This sad in different catalogues you can see different names for this color or shades that looks rather similar. It is so that a color named pink can have many shades to it. I feel the two Wenger knives on the picture are almost the same. It is difficult to get the correct shade for the color for these knives. If you are interested in more information on the RangerGrip then I can inform that it is in the novelties Wenger knives. Since it is introduced at a later time and that it is a novelty then it is a bit extra special.